GB 17 belongs to the family of Galbulimima alkaloids which can be found in the bark of a rainforest tree with himbacine as a promising lead structure for muscarinic receptor antagonists. 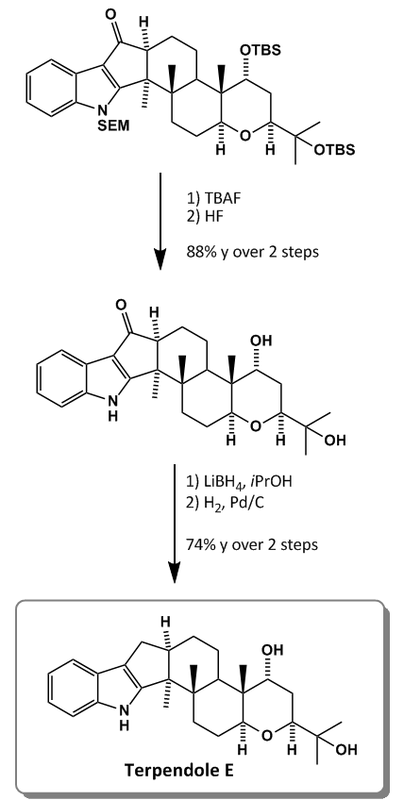 Himbacine-like compounds were tested for the treatment of Alzheimer’s disease as thrombin agonists. Other family members including himandrine, GB13, himgaline, and GB16 have been synthesized. 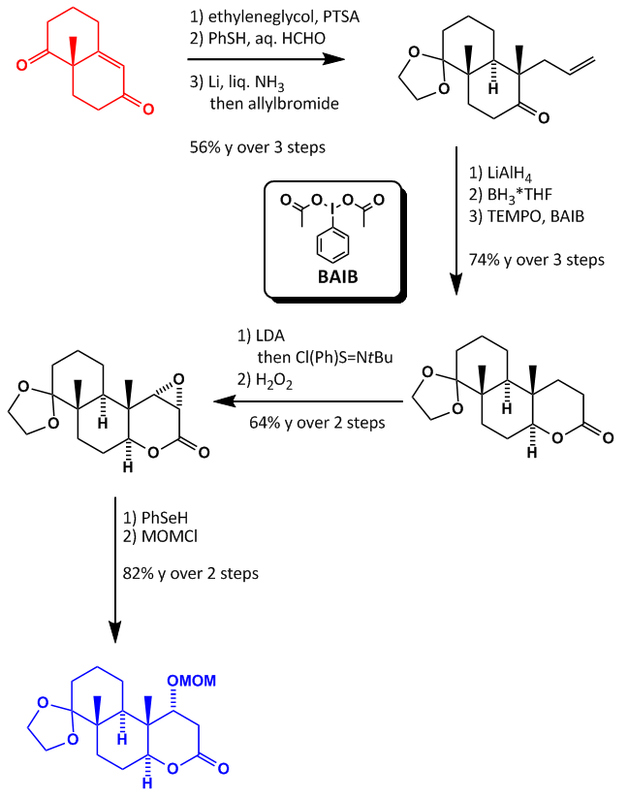 To date no synthesis of GB17 is known so the Thomson group accepted this last challenge. 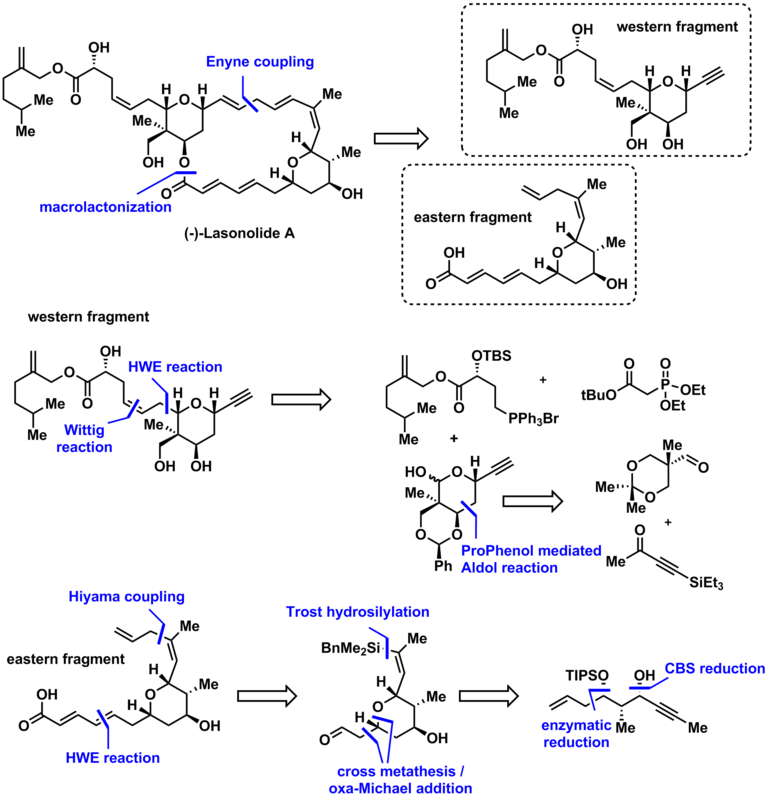 The retrosynthetic analysis is shown below. Nothing real spectacular but a nice access to the tetracyclic carbon skeleton is presented. The first building block is readily available by a methodology developed by Lhommet et al. 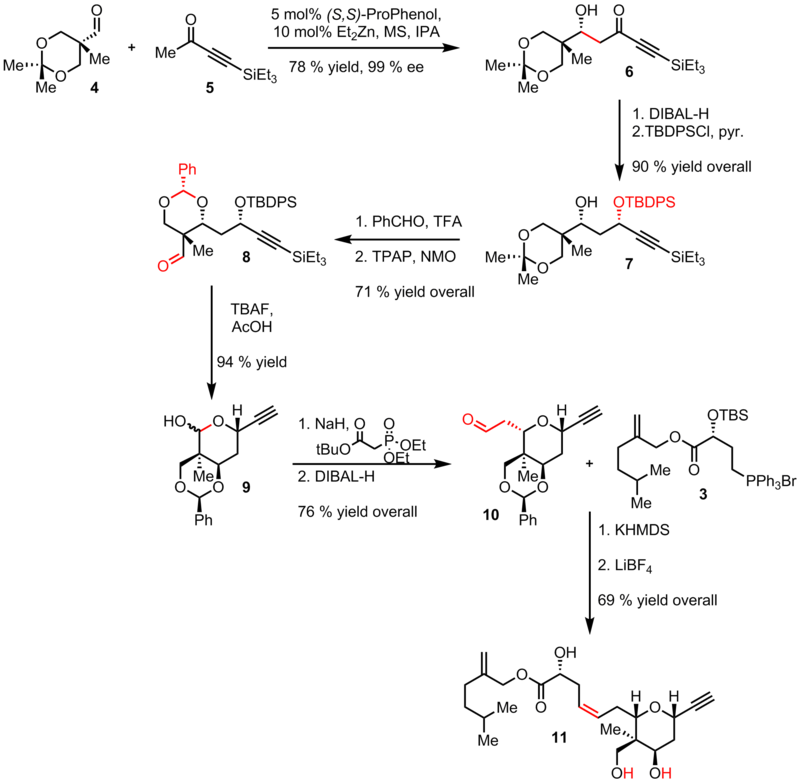 Reaction of ester 1 with (S)-phenylglycinol yielded oxazolidine 2 which was hydrogenated to give piperidine 3. The yields are not reported but considering the original publication about 40 % yield can be achieved. Treatment of ester 3 with lithiated phosphonate and Boc protection of the naked amine gave ketone 10 . 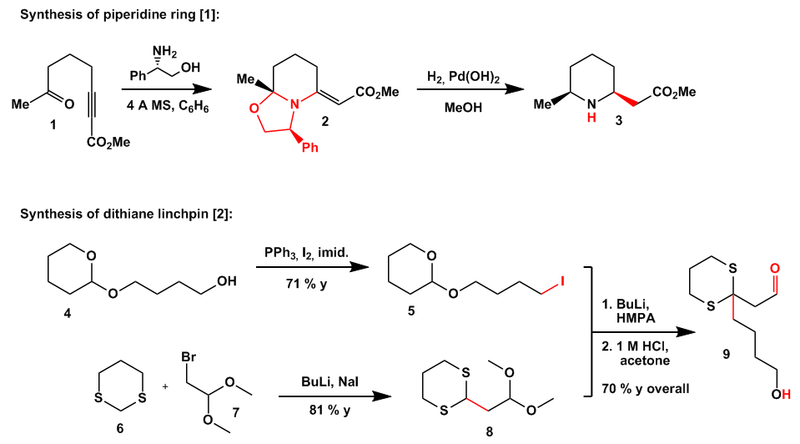 HWE reaction with linchpin 9 under Masamune-Roush conditions and subsequent DMP oxidation furnished aldehyde 11. After some model studies the group found that a TMS-prolinol catalyst gave highest yields and enantiomeric excess on a multigram scale. In a one-pot procedure the aldehyde was converted to unsaturated ester 12. 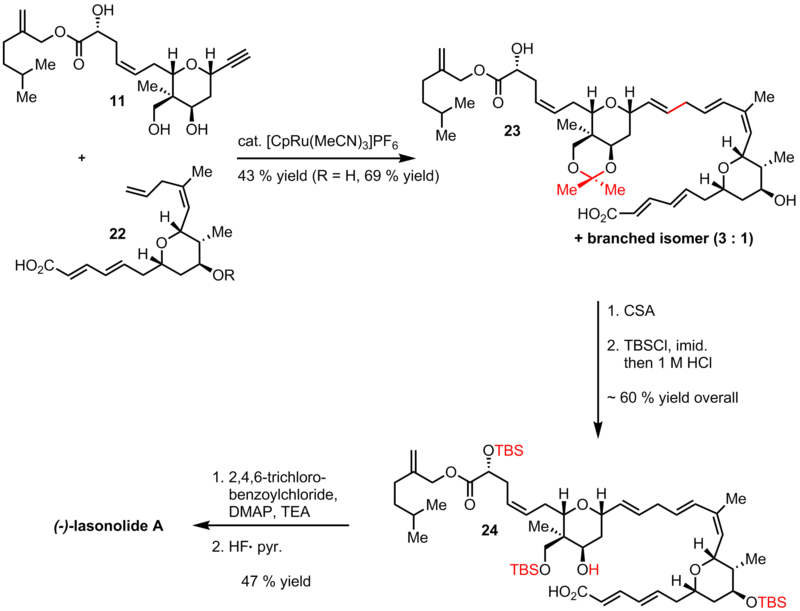 Base induced cyclization, amine deprotection, and lactamization yielded tetracycle 13 in moderate yield. Nevertheless it was found that the wrong isomer had been formed together with complete inversion of the stereocenter next to the amine. 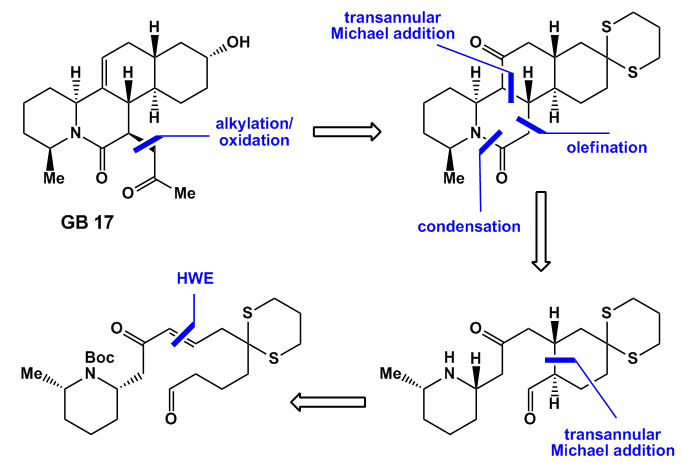 Obviously the (E)-configured ester gave the wrong stereochemistry in the Michael addition step, so the group proceeded from 11a through a Still-Gennari modified HWE to give again under Masamune-Roush conditions ester 14. Boc deprotection and this time sodium methanolate induced cyclization did the job. Under these conditions the lactamization occurred to give 15. The keto group in 15 was removed under standard conditions by formation of the vinyl triflate which was reductively removed in the presence of Pd and formic acid as the hydrogen source. 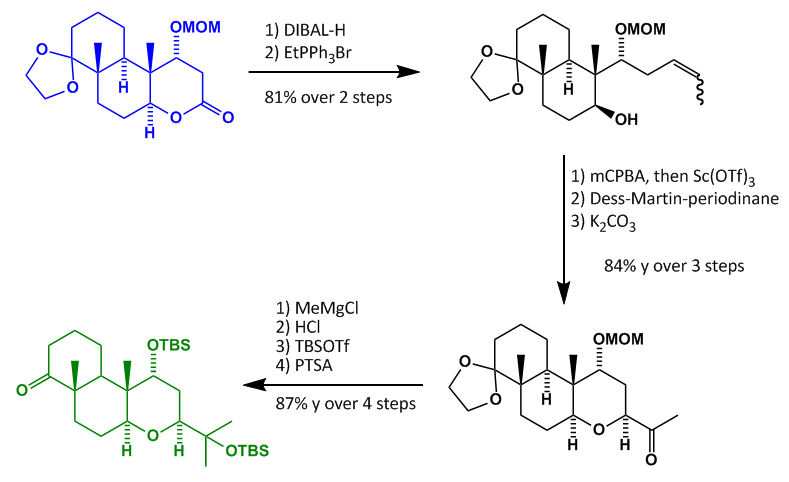 Stereoselective alkylation of the lactam was followed by dithiane removal, reduction, and oxidative cleavage of the exo-methylene group to give GB17. 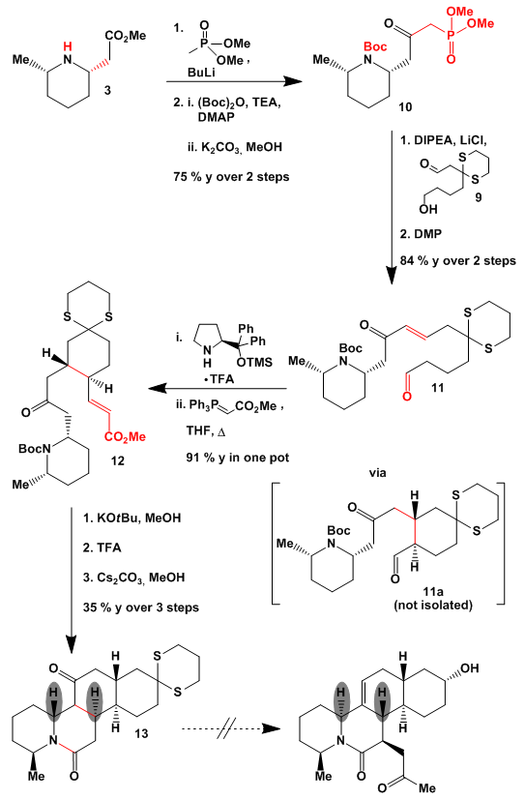 To explain the stereochemistry in the organocatalytic step I would propose the following transition state. Enamine formation of the prolinol ether should lead to the transition state with the least steric interactions. McMillan’s catalyst or proline gave much lower ee values. 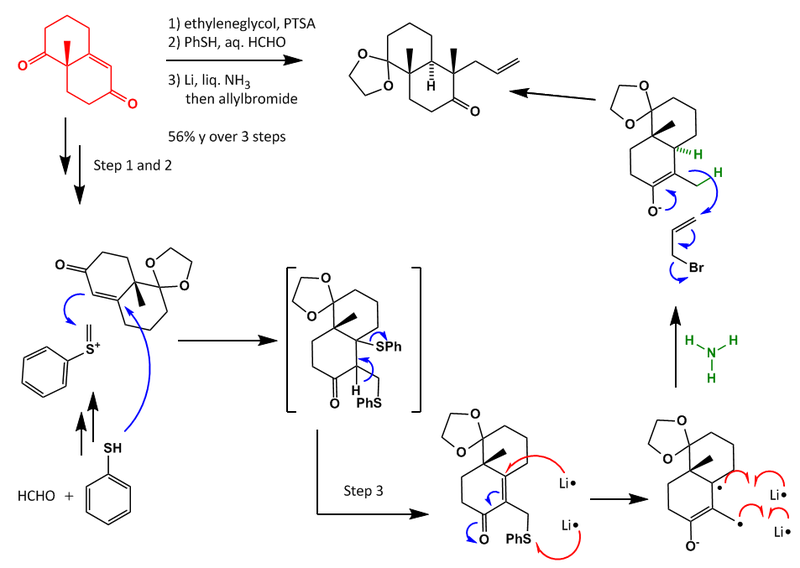 The outcome of the cyclization step can be explained considering the transition states shown below. In structure 12 steric interactions between the large Boc group and the ester force the double bond into an axial position. Alternatively without the Boc group and with a (Z)-double bond the ester group is equtorial so steric interactions can be minimized in the conformer shown. And as usual THX to Bobby for proofreading. The specificity of the reduction step can be explained by looking at the particular bonds which are reduced. 1) The enamine bond is reduced stereoselectively by facial differentiation from the Re face. 2) The aminal opens up to an imine which is again reduced to the amine. 3) The auxiliary is cleaved off. Interestingly the group protected the amine after the BuLi chemistry which results in the usage of > 2 eq of lithiated phosphonate. 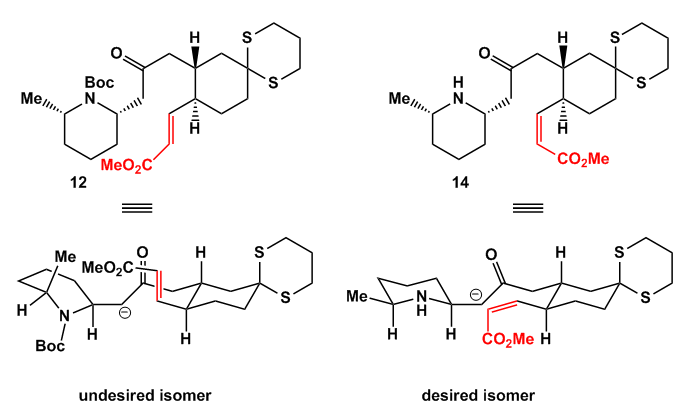 Maybe earlier Boc-protection gave racemisation through DoM-chemistry with some help from the Boc group. Racemization was later found to occur in the presence of tBuOK. The group stated that the dithiane protecting group was essential for the reactivity of the substrate. Without this group almost no transformation was observed. Considering the great Thorpe-Ingold effect of this protecting group it might be an explanation. 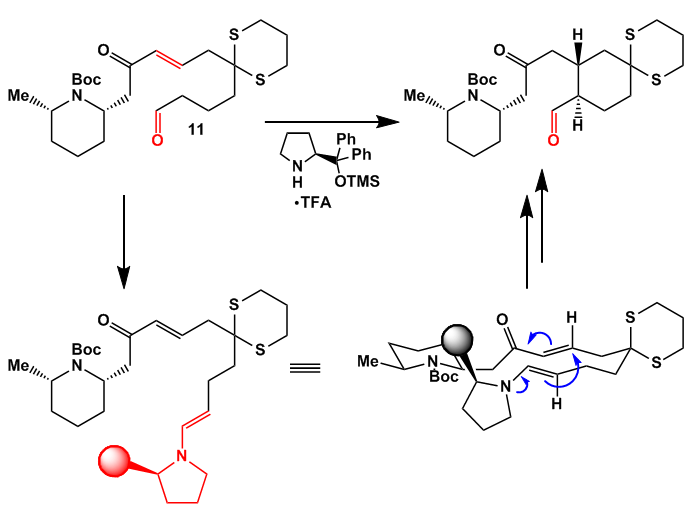 It took some time but now it’s finished: this time featuring a very cool asymmetric synthesis of the natural product Polyanthellin A. I do remember an extremely effective synthesis from Overman in this class of natural products a few years ago employing his oxy-Cope/Mannich-tandem reaction. In this paper the attention is less methodical nature and more focussed on the target itself. The key step in this synthesis features an asymmetric formal [3+2] cycloaddition starting from the 2 fragments which I will call from now on the red and the blue one. This paper is full of interesting chemistry, too much for this little review, so I will focus only on the key aspects. If you’re interested we can discuss the reactions I did not picture in full detail later in the comments. 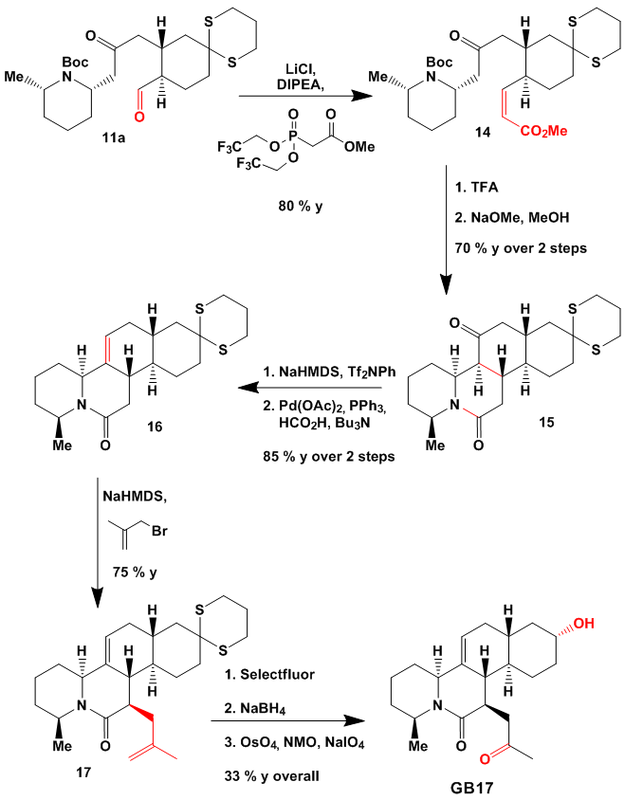 First a more or less standard Michael addition catalysed by Prolinol-derivative (1) and catechol ester (2) to give the 1,5-diketone in high yield. A Wittig reaction with titanated allyldiphosphine yields the required Z-allyl side chain which was followed by methylcarboxylation using Mander’s reagent furnishing the functionalized malonester. Diazotransfer and subsequent carbene inserton catalysed by (3) into the nearer double bond gives in the end the red fragment ready for the formal [3+2] cycloaddition. 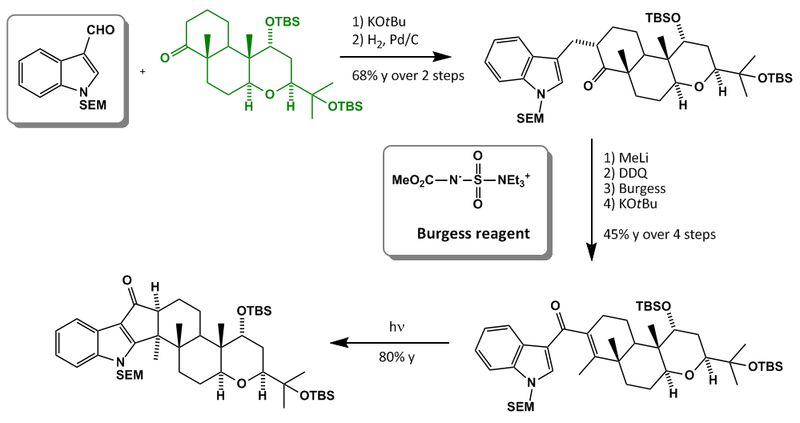 However they needed 3eq of the blue fragment but this gives them the core structure in a very good yield and stereoselectivity. 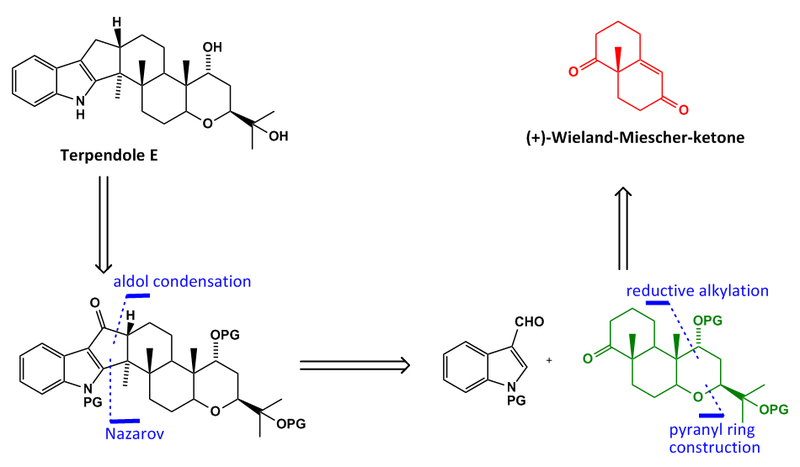 A metathesis employing Grubbs II closes the ring ensued by Krapcho decarboxylation, a sequence of hydroboration/TPAP oxidation and another Wittig reaction completes this scheme. First a Lewis-acid catalysed cyclopropane opening gives the stabilised allyl cation and the enol ester which in turn attacks the carbonyl in an aldol fashion followed by ring closure from the enolate oxygen. Or a more concerted cyclization? Simple iodo etherification, oxymercuration and global reduction yields the naked Polyanthellin which was acetylated to give the desired product. To my surprise the JACS paper is only 2 pages long… I would have expected the paper to be at least 4 to 6 pages long to show how they employed the specific methods cause some of them a really rare. 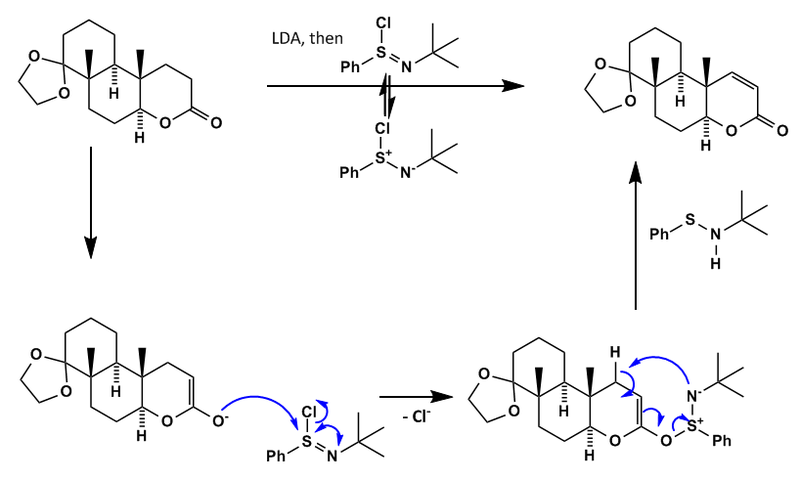 That’s why I prefer the Angewandte papers: they feature almost the complete synthesis in detail, which is not always useful but gives you a better insight into the planning and realization of such a complex synthesis. Ok, that’s it from my site, any comments?